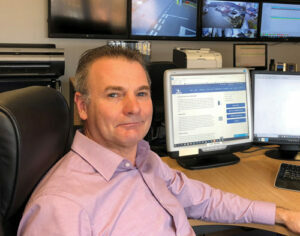 Dave Sanders is Managing Director at Justice Fire and Security. With a Birmingham Head office and local offices covering greater Midlands and surrounding counties, most of the company’s management team have been together for over 20 years giving the business over 150 combined years’ expertise in the electronics security industry. Accreditations include NSI Gold security (including BS 8418 scope), NSI Fire Gold, BAFE SP 203. Do you use a distributor or buy direct? We use both distributors and buy direct from the manufacturers. Like many companies we stick to the same products for ease of servicing and logistics as well as training. We use Castle/Pyronix throughout our intruder alarm discipline from the smallest residential property to a large 200 zone commercial property. Our intruder alarm equipment is usually purchased through distributors. CCTV is usually Hikvision and as we are one of the few companies with the BS 8418 (detector activated CCTV) scope we also use Dedicated Micros and the Optex Redwall detectors. For access control it’s Net 2 and Videx for smaller door entry type systems, for fire we use a combination of Fike which we purchase direct and Apollo/Advanced. We also supply and maintain fire extinguishers and we are SmokeCloak installers both of which are purchased direct. Is third party accreditation beneficial to your company? Without doubt third party accreditation has been beneficial to us. Recognised by insurers, police and fire authorities alike and for keeping standards high NSI has been beneficial to us. We applied for accreditation back in 1991 when it was then NSCIA and we got caught up in the transfer to NSI during our application stage. In the early days of quality management (BS 5750 which became ISO today) I couldn’t see the point of all the paperwork, checks and balances etc, however as Justice has expanded over the years and I become less hands-on with more staff employed the quality management system is beneficial. I believe though it is very difficult for a smaller business with ISO to cope with the workload that is often unnecessary when the owner/manager is day-to-day hands-on. What would be a typical project for you? We have in excess of 10,000 installations to date and every one of them differs slightly, so I can’t say what is typical however a perfect installation to us would be a multi-discipline consisting of intruder and fire alarm systems, CCTV, access control, fire extinguishers and some emergency lighting. A nice addressable fire alarm system of around £40-50k is always comfortable to us as is an equivalent CCTV system. However, we do carry out many installations with an average order of around £3-£5k. We have concentrated on the SME and private markets over the years, which is what gives us our strength. I prefer to have many customers owing us a little bit of money rather than a few larger customers owing us lots of money and the risks involved with that. 85% of our customers would recommend us and return to us year after year so we must be doing something right. Are there any common requests from customers that give you problems? Two that I can think of. Firstly, when they have a fault with their system when arriving in the morning but don’t think to contact us all day and at 5pm, when they are going home, suddenly realise they can’t set the system and phone us frantically expecting an engineer there in ten minutes to sort the problem out (remote servicing has helped with this problem). Secondly, a quote that they received many months ago and have sat on despite us chasing, then decide they want the work doing, but want it yesterday!